One thing I try not to be on my blog, is too opinionated. Right about now, many of my readers are saying, “Hold on a minute, Pete!! Not opinionated!!?? – what about your take on Footpath Bike Riding in Woodlands, or Voucher Aunties, or numerous other subjects?”… Well ok, perhaps I can be passionate from time to time, and sometimes I may be quick to post an article… but when I do, there’s usually a very good reason. 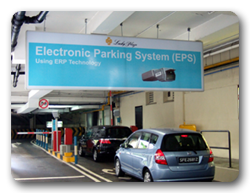 Since I’ve been driving in Singapore (a grand total of three weeks now), I’ve noticed a very strange but dangerous phenomenon – the many speeding motorists in shopping centre car parks. The speed limit signs I’ve seen in these car parks range from 10km/h to 20km/h (and I’ve even seen a sign I’ve not noticed anywhere else before – “Dead Slow”. The reason behind these low limits is extremely obvious. The number of pedestrians sharing the area is many – from toddlers right through to the elderly. In the short few weeks that I’ve been frequenting the car parks, I’ve already witnessed many close calls. Drivers speeding through the car parks, oblivious to those around them, and pedestrians jumping out of the way to avoid being run down. Now, far be it from me to suggest that Singapore should implement more fines, but these drivers need to be penalized. I have seen speed cameras on the roads and highways – why not police the enclosed spaces as well? All it will take is for an unsuspecting pedestrian to accidentally step out into the path of a speeding motorist, and we may well see a very serious injury or even death occur. Obviously, pedestrians should be very mindful and wary in car parks, but this does not take away the onus that is on the motorist to use common sense and slow down to the limits. It doesn’t matter how good a driver you are, nobody has the reaction speed to be able to stop and avoid a collision in just a short number of metres when your vehicle is travelling at around 50 or 60 km/h. I therefore call on all of my readers to take care. If you do use car parks, then when you are out of the vehicle please be very wary of motorists. When in the vehicle, think of the potential consequences and slow down to the limits. By speeding through, you are not gaining any time savings (perhaps just a matter of seconds), all you are doing, is endangering the lives of others.